﻿ Listen to DRM Digital Radio Broadcasts. The 12 kHz Converter Circuit. The Digital revolution has come to Shortwave Broadcasting. Enjoy the perfect quality and clear reception. 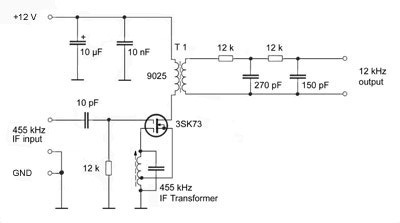 The first idea to get a quick start into the world of digital radio was born: Take a Dual-Gate MOSFET, feed 455 kHz from a short wave receiver to the first gate, hook up an IF coil as a simple 467 kHz oscillator on the second gate and recover the 12 kHz on the drain. Add an interstage transformer from an old CB transceiver in the drain of the FET to keep the radio's ground and the PC ground apart to avoid irritating hum.